Like most people, the soft plastic bushings in my window regulators were shot. I did a lot of poking around but didn't find much. The few I saw required removing the plastic rollers. I did some research and experimentation at home and came up with a cheap and easy replacement. Take a look and let me know what you think. Very nice write-up with some great parts-sleuthing. Thanks for posting. I've always had limited trust in adhesives (especially when they get exposed to solvents and oil or grease). Nevertheless, modern-day adhesives are becoming very sophisticated and the results can be quite impressive when you find the right adhesive and apply/employ it according to the manufacturer's instructions. Your 'hang' test demonstrates very promising results. Hopefully, the exposure to the lithium grease won't be an issue, longer-term. Grannyknot did a posting here a few years ago in which he showed how he had pressed out the roller shafts from the regulator arms and then successfully re-installed them after installing hard-plastic cone-faced tarp grommets as a substitute for the pooched soft-plastic originals. Your soft roller alternative looks like an improvement. As an alternative to the washers mentioned, since you need to buy 25, McMasterCarr has very similar neoprene washers that you can by fewer of. They are listing as 55 durometer. I'd also like to suggest some trials with 'super glue' as the o-ring adhesive. There are o-ring kits out there that have bulk o-ring rope,, a razor blade, and a tube of crazy glue so you can make any size o-ring you want! Time will tell. The bushings do take some abuse, both physical and temperature extremes. Rubber is hard to get a good bond to, especially if it has processing/plasticizing oils added. The stuff that "sweats" out and makes it feel slippery. Hate to be a downer, love a new idea, but I wouldn't rush out and try this until some time and use has happened. I think I included a link to that. 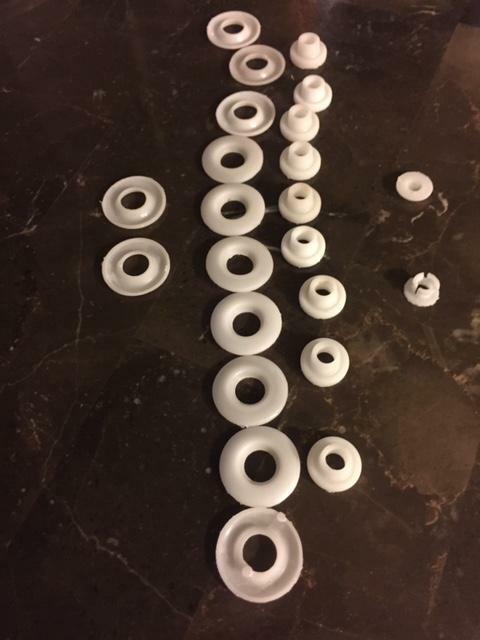 I ordered the same grommets but they're triangular now instead of round. His idea is great but I didn't want to mess with the rollers. I'll take at look at McMaster Carr. Don't know why I forgot about them. They're a great resource. I tried some "ordinary" superglue but it didn't adhere as well to the rubber. The Gorilla Glue worked better than I'd hoped. I tried using o-rings but they didn't cover enough of the metal. It's worth looking at again. I agree rubber can be tough to bond. The first glues I tried didn't work so well. I thought about using a "slippery" plastic like polyurethane or UHMW but it meant removing the roller shaft. I agree about wanting to see how it works in a real-life situation, so maybe I can make some type of motion simulator and let it run for a few days. You might try stretching an o-ring over the existing roller. It won't need gluing and you'll get the advantage of the lubricity of the material. O-rings are interesting things. They're actually designed to take the place of seal "packing", as I understand things, and are supposed to be fit to a precisely machined cavity. Not supposed to be exposed. I designed and printed replacements for the washers. Printed in TPU - oil, grease resistant & extremely flexible. it has a similar flexibility to rubber. Does not require the rollers to be removed will flex enough to get over. I have the rollers and cups. Grind off the back of the shoulder rivet and press out the rivet. The press back in the rivet and put a small tack weld on it. What is the material? I think that the originals are nylon.